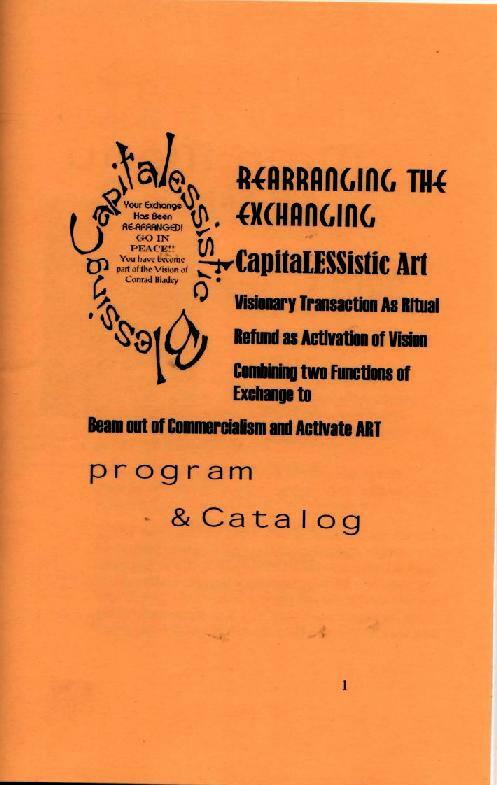 Capitalessistic Art- Re-Arranging the Exchanging! To make a donation to the artist via pay pal click here. Thanks in advance! 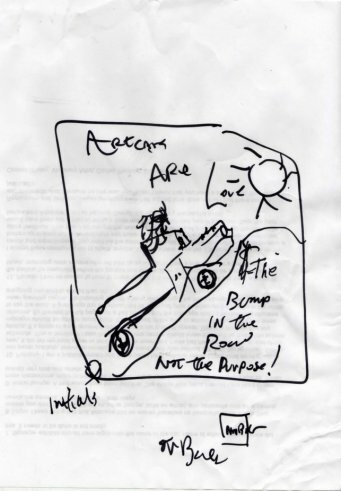 Problem: I am a visionary outsider artcar artist or "cartist" who does not want to change his visionary philosophy and nature of his art experiences and outsider nature by becoming a "vendor" artist. One who combines sales with the art. To be perfectly clear:. there is nothing wrong with cartists who combine artcar appearances with vending. It is simply not my calling, nor, my philosophy. I have combined art with vending. It turned out not to be rewarding for me. I tried selling note cards, books, and artworks. Although the merchandise was popular it did not provide positive experiences and did not work for me. It was a lot of work lugging the items from place to place often resulting in the items becoming worn and damaged. I found that dealing with money was tedious and distracted from the overall artistic experiences. Accounting was also extra work and took much longer than the transactions themselves. 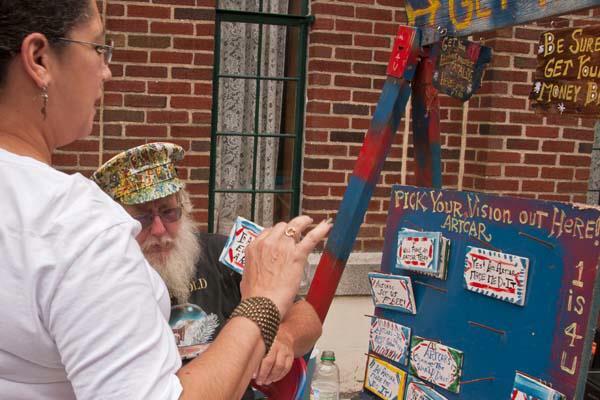 In 2010 an artistic director supervising the Baltimore Artscape Artcar show criticized me for suggesting that local cartists not selling things might be given a reasonable honorarium payment. After all, Artscape is a very well funded event and it is a commercial event where people sell food, art and all kinds of things. Performers are paid, the Artscape staff is paid and even the out-of-town cartists are given a small amount of money to cover gas and wear-and-tear as well as hotel rooms. I suggested that because it is not a festival that supports a local visionary arts institution or community as does the Orange Show artcar festival, or a museum which is supported by the Kentucky Artcar weekend, it is essentially a commercial festival that should support those who turn out to draw and entertain the crowds from whom vendors make their profits. I enjoy volunteering to help appropriate artcar events. I would suggest that the festival configuration which best meets my needs would be one run entirely by volunteers and donations. There is nothing wrong with volunteerism except when the efforts of volunteers are being used for others to make profits. My cars are daily drivers. We have no ordinary cars. I drive my cars each day receiving plenty of the "exposure" often promoted as a benefit by artcar event organizers. For me artcar events are modifications of my daily activities that simply change the nature of the daily display of my art and do not necessarily extend it. 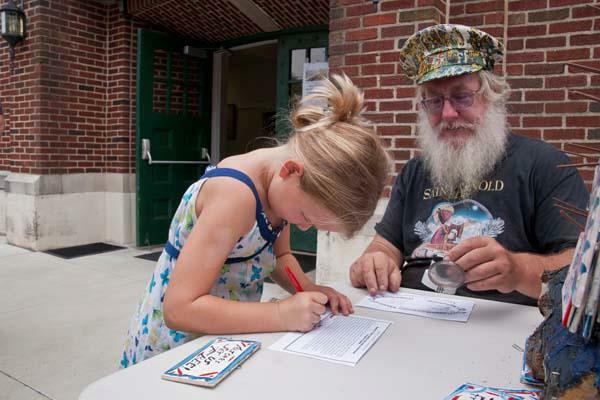 My Artscape appearances therefore, are additional work. The car has to be mechanically maintained, supplied with gas. The art is freshened up and often extended each year for the festival. After each day of festival there is wear and tear that has to be repaired. I combine my artcar art experiences with performance art experience. This involves the construction and refurbishment of costuming and provision for music. Unlike other festivals, Artscape only minimally feeds its volunteer cartists so food and drink become an issue.. To top it off there is the extreme heat. Artscape is held in mid-July. So my appearance is a significant burden especially for one who does not sell things, is not a vendor. The artistic director told me that I should just change my philosophy, get over it and find something to sell like the rest of the cartist vendors or I could alternatively not attend. This is not something I could do. I believe strongly that creating and driving artcars is a way of life. I am at the festival to bring that message to others, not to sell things. While Artscape is a burden it does bring me in contact with other cartists with whom I can network and exchange technological solutions. I also enjoy giving visitors to the festival a closer look at my art which they generally see only on the road. I enjoy answering their questions and providing the many photo ops. The motivation to continue my association with commercial events is strong. While not giving up hope for a reasonable honorarium, and being still able to sustain the costs I still face a threat to my philosophy an d art experiences. It is important again, to note that this is a personal choice. I am not advocating in any way the "chasing of the moneylenders from the temple" but, am simply interested in re-arraigning my own exchanging. How could I turn this situation into something positive? 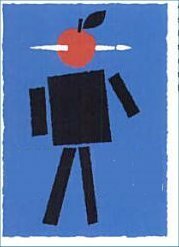 What changes would have to be made to the current model, that is to the model by which cartists come to a festival and sell objects and engage in commercial activity in order to accommodate my philosophy. 1. Cartist creates or purchases objects. 2. Cartist sets out a store which and displays his objects, prices them and offers them for sale. 3. Customers come, examine objects and exchange money for them. 6. Possibly if a customer is not happy with the object they could come back to the cartist for a refund. 1. I don't mind making art. I like people to enjoy it and I enjoy letting them have the art. 2. Transactions are valuable social acts. Shaking hands at the end of the deal, negotiation, discussion of the product are all enjoyable experiences. 3. Collecting money creates a work and is a problem. Giving change is work. Accounting for it is additional work. One never seems to ever get enough money or make a large enough profit at these things any way. Money most likely has to pay bills or be saved and is generally not enjoyable. Money could be removed from the activity where possible. Instead of a capitalist act it should be a capital free or capital-less act. To remove capital from the act I would have to re-arrange the exchange. Money would still have to be exchanged, but utilizing the transaction of the refund it could be removed again. 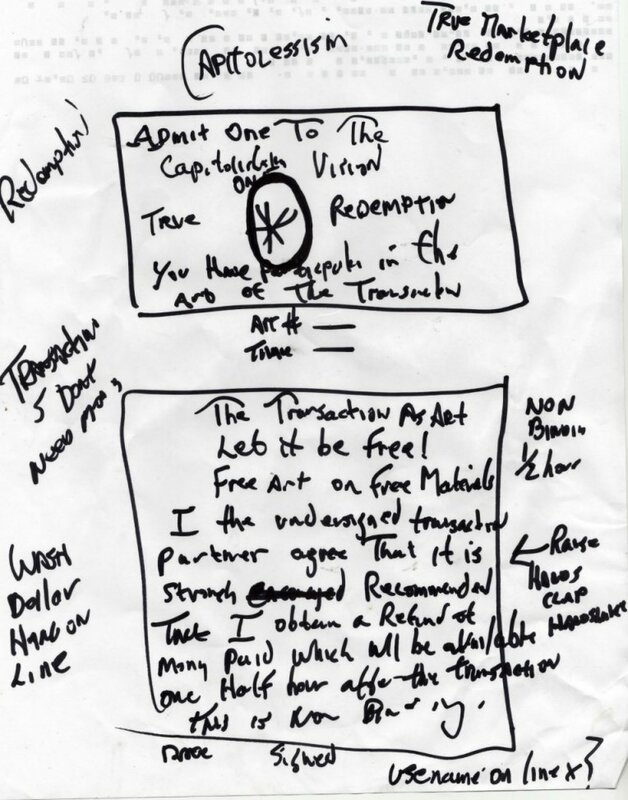 Therefore, the art would be in the transaction. Transactions would have handshakes and gestures. Customers could discuss the art and interact with the cartist. I could join and enjoy commercial events fitting in without changing my values. 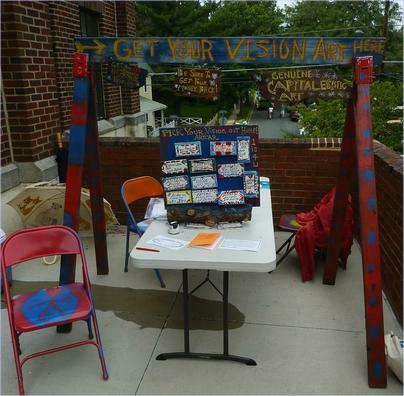 1.Artist displays art, sign and table. 2. Co-artist inspects art and selects a piece to purchase. Co-artist discusses art and process as needed. 3. 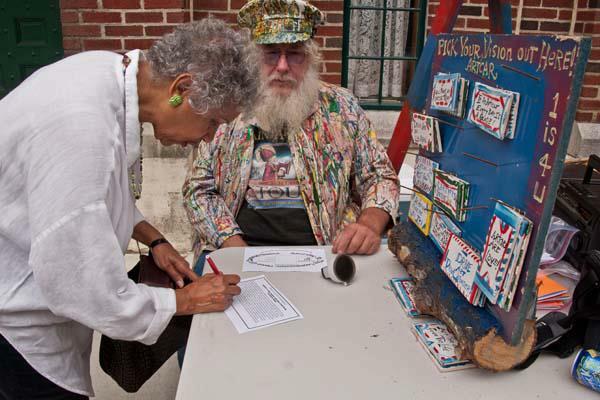 Co-artist complete agreement by shaking hands and gesturing with hands over head and receives annotated coupon. 4. 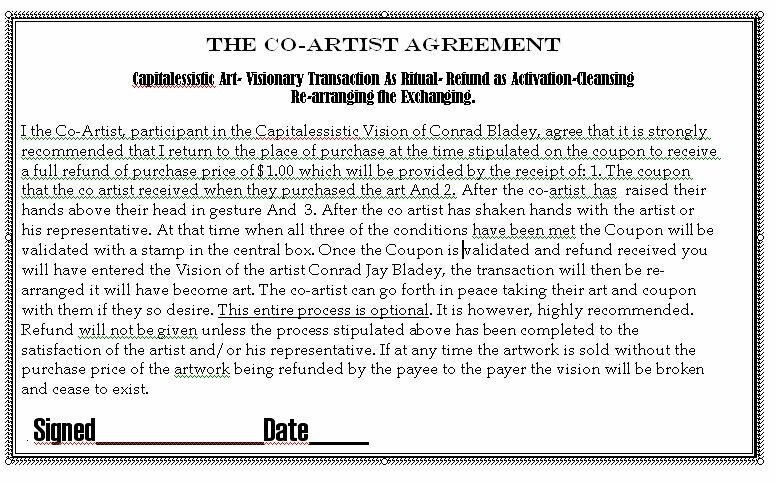 After a specified period of time the Co-artist returns to the artist with the coupon and artwork. Artist validates coupon and stamps it. 6. Co-artist may take the art with them if desired. 3. After the co artist has shaken hands with the artist or his representative. At that time when all three of the conditions have been met the Coupon will be validated with a stamp in the central box. Once the Coupon is validated and refund received you will have entered the Vision of the artist Conrad Jay Bladey, the transaction will then be re-arranged it will have become art. The co-artist can go forth in peace taking their art and coupon with them if they so desire. This entire process is optional. It is however, highly recommended. Refund will not be given unless the process stipulated above has been completed to the satisfaction of the artist and/or his representative. If at any time the artwork is sold without the purchase price of the artwork being refunded by the payee to the payer the vision will be broken and cease to exist. Upon receipt of $1.00 cash and the signing of the co-artist agreement the artist or his representative will issue the artwork and the following coupon. 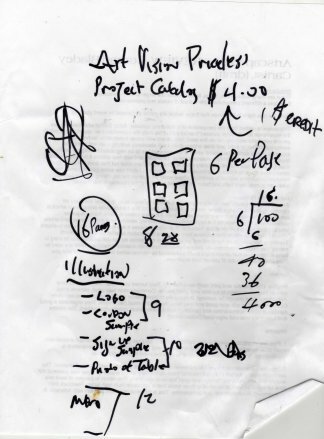 The co-artist will be instructed to return after a specified period of time (30 minutes) to validate and enter into the Capitalessistic vision. 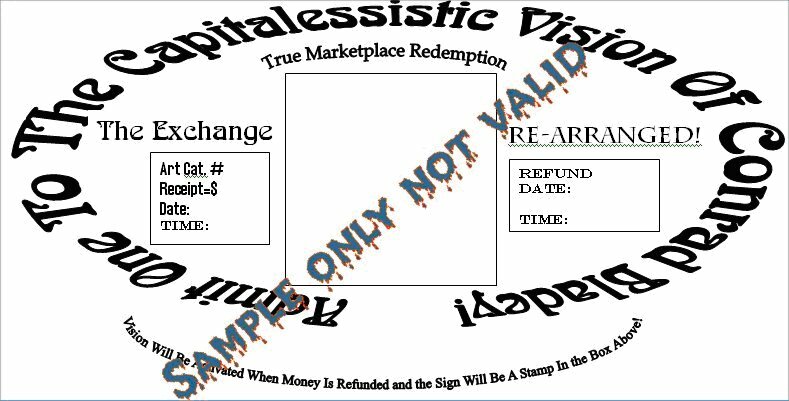 The Visionary act will be activated following the presentation and stamping of the coupon. During this process the artist or his representative will exchange gestures: handshake, wave of hands above head. The co-artist will go in peace with coupon and artwork. The catalog is not an artwork. It is a guide to the event, a program, if you will. The Catalog will contain black and white images of the batch of numbered artworks as well as all information provided in this web page. It will be sold at reasonable profit and will be available for purchase by anyone including the co-artist. The catalog is not provided to the co-artist free of charge. Please send me ________copies of the catalog at $4.00 each. Cash check or money order. (paypal to cbladey@verizon.net $4.25 each.) This price includes book rate postage within the United States. Inquire for other postage rates: cbladey@verizon.net Make payable to Hutman Productions.